Prices pressures in the UK have been easing since late 2017 when annual inflation peaked at 3.1%. But with the effects of the pound’s slump after the 2016 Brexit referendum dropping out of the CPI calculations, oil prices falling back sharply, and subdued global demand, the headline rate is expected to slip below the Bank of England’s 2% target in January, from 2.1% to 1.9% year-on-year. The core rate, which excludes energy, food, alcoholic beverages and tobacco, is forecast to remain unchanged at 1.9%. The inflation numbers alone are unlikely to worry the Bank of England, who is already anticipating for the consumer price index to ease below 2% in the first quarter of 2019 before rising back above it towards the end of the year. With inflation projected to stay above 2% in 2020 and 2021, the Bank is likely to resume its rate hike cycle if there is a smooth Brexit. That possibility is what’s currently preventing the pound from sliding more sharply amid a deteriorating growth picture in the UK. 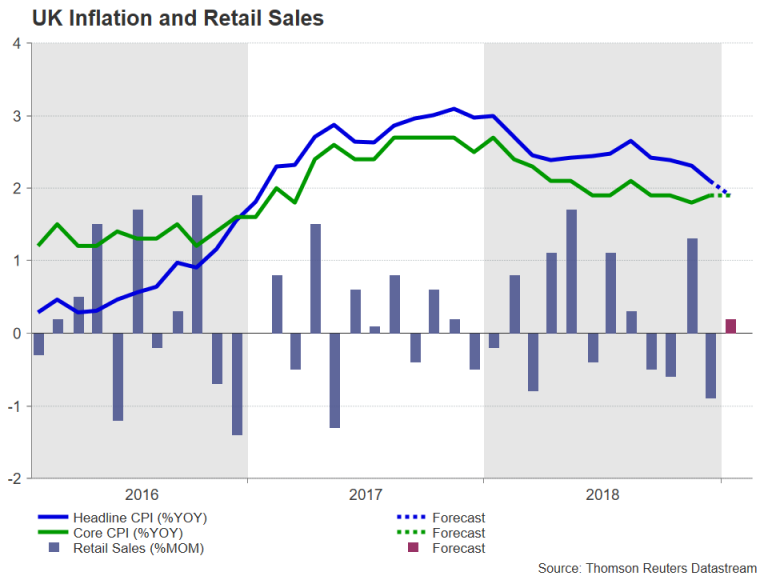 Should the inflation and retail sales figures send more warning signs about UK growth, dampening expectations about future rate hikes by the Bank of England, the pound could easily lose the grip on the immediate support level of $1.2825. This happens to be near the 50% Fibonacci of the January uptrend and falling below it would also take price action below the 50-day moving average. Such a move could accelerate the declines towards the $1.2675 support region before attention turns to January’s 21-month low of $1.2436. However, if the data isn’t as soft as what’s being anticipated, particularly the retail sales numbers, sterling could post a mini-rebound, barring of course any negative headlines surrounding Brexit. The pound could initially attempt to take on the 38.2% Fibonacci at $1.2918 before targeting the $1.30 handle, which is just above the 20-day moving average. A break above $1.30 would clear the way for the January peak of $1.3216.